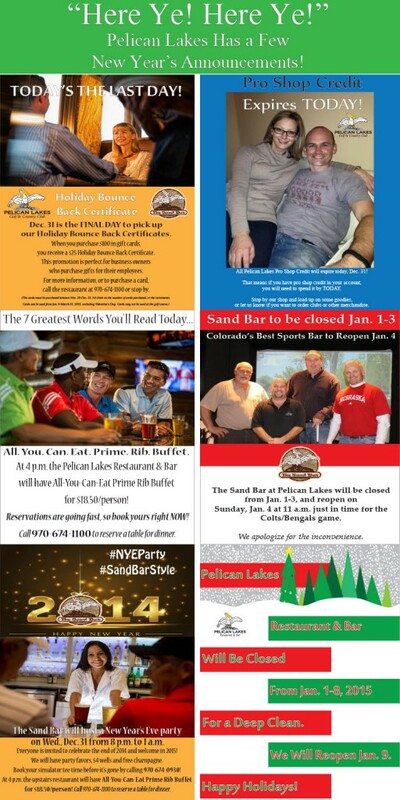 Pelican Lakes Restaurant & Bar and The Sand Bar at Pelican Lakes are hosting two New Year’s Eve events tonight, and YOU’RE ALL INVITED! The restaurant is offering an All-You-Can-Eat Prime Rib Buffet for $18.50 per person with reservations starting at 4 p.m. Call the restaurant at 970-674-0930 to reserve a table. Then later in The Sand Bar, you can party the night away during its New Year’s Eve party from 8 p.m. to 1 a.m. There will be $4 well drinks, free champagne and PLENTY of new year’s cheer! Call ahead and book a tee time on one of our three golf simulators and play a course like Pebble Beach as you celebrate the closing of 2014. To reserve a tee time, call (970) 674-0930. Everyone at Water Valley wishes you a safe and joyous New Year’s Eve! See you in 2015!